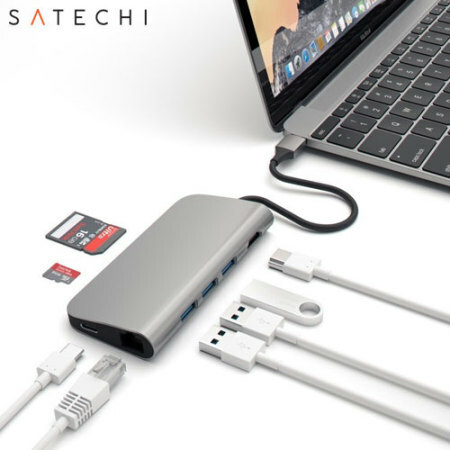 Using the USB-C (USB Type-C) port on your MacBook or laptop, add 3 full-sized USB ports, a USB-C port, an Ethernet socket, SD and Micro SD card readers and a 4K HMDI port to your computer with this versatile, useful adapter in space grey from Satechi. Lives up to description - a very good multiport box. Looks nice but.... 1. All USB ports are upside down. 2. It gets very hot. 3. Only one USB port works at one time (Had my camera downloading some pictures on one and iPhone on another. IPhone stopped charging and disconnected itself from MacBook). For the price I might as well bought a genuine Apple product. There are enough connections for normal use ... its' getting quite warm after a while, handy to use at home or take it on your travel. The connection to the PC with a cable is fine and makes the use flexible. Initial impressions, great looking stylish accessory, has all the ports you will need and makes connecting your laptop to everything as simple as a single connection. Integrates seamlessly. The only slight negative is that it isnt heavy enough to hold itself down to the desk, until the cables have settled it has the temptation to stick up in the air. Looks premium and colour matches, it just works!! Really good all in one product. Super fast and lightweight to carry. Cord is perfect length not too long or short. Has all the ports I need plus more. This is small and neat with s range of connections. I recently bought a new MacBook which only has USB-C connectors so all my current accessories were useless without using adaptors. This multi-port adaptor means I can now use all my existing accessories. The Satechi Adapter has worked well so far and all ports have been tried.The only criticism I have is that after a short time in use the adapter becomes warm/hot. I hope this will not become an issue for what appears to be a well constructed adapter. I purchased 4 of these but unfortunately one was DOA but Mobile Funs RMA system is very good and I soon had the item replaced. At last we have found an adapter that works with our Lenovo Yoga 910. This laptop only comes with Type C connections only and no HDMI to connect to our TV. Another adapter we ordered online didn't work but this one is great and has a card reader, ethernet and extra USB's as well. I would have liked a longer cable to reach the desktop when the Yoga is used in A frame mode however. This is ideal for travelling and carrying around. It has all the necessary ports and well worth the price compared to others on the market. NIce Unit BUT gets VERY VERY HOT take care! The Satechi multi-port him is of very good quality and so simple to use: just 'plug and go'. Connected to my MacBook Pro 2017, currently I have the HDMI port to a 2nd monitor, USB ports to iPhone and iPad, and have used the SD Card port. However, I do have a concern by the heat it produces - it gets very hot indeed. As it is very hot to the touch I am a little concerned about a potential fire risk that I have it resting on a ceramic tile. I'd be interested in a comment from Satechi, to see if they have received similar feedback from other users. worth the money, worth the wait. Way better than what tech shops are selling, this gives you everything. My only concern of is the long term wear of the long wire. Though very good quality. Easy to install (just 'plug & play' - no drivers required), neat & compact with a good range of different types of ports, USB powered & good value by comparison with other similarly specced hubs. I've only had the item for a week so cannot comment on long-term performance but, so far, it does what I require so would recommend it. My main concern when I needed to upgrade my Macbook Pro was backwards compatibility with all my legacy USB devices. My primary use for my Mac is DJing and Music Production. My Allan & Heath 4D Mixer is my main tool that connects to my Mac for this purpose. The Satechi hub doesn't miss a beat, I've had it running at full capacity with my mixer attached to 1 USB 3.0 port, a USB 3.0 external HDD, my mate was able to use the 3rd USB 3.0 to plug in his Traktor Kontrol S4. Absolutely everything worked seamlessly all through one USB C port with the Satechi plugged in. Also, just to check the pass through function I was also charging my MBP through the USB C port on the hub. I've also had it running my HD Projector via the HDMI port and when I'm at my desk and doing some serious file transfers to my NAS drives the ethernet connection has been flawless. I've not had the chance to use the SD card readers as yet but judging by my above experiences I don't expect there to be any issues. I will at some point give the hub a full workout and have everything plugged in at once and if possible will update this review, however from my experience so far it's absolutely the best multi-port-adaptor I've ever used, USB C is brilliant it really can do it all.